The Xavier University Newswire students can sell Bright Ribbons: Weaving Culturally Responsive Teaching Into the Elementary Classroom (ISBN# 1506325254) written by Lotus Linton Howard, Lotus L. (Linton) Howard and receive a check, along with a free pre-paid shipping label. 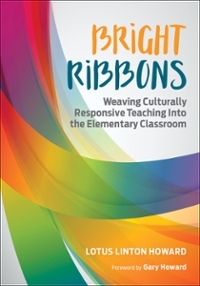 Once you have sent in Bright Ribbons: Weaving Culturally Responsive Teaching Into the Elementary Classroom (ISBN# 1506325254), your Xavier University Newswire textbook will be processed and your check will be sent out to you within a matter days. You can also sell other The Xavier University Newswire textbooks, published by Corwin and written by Lotus Linton Howard, Lotus L. (Linton) Howard and receive checks.